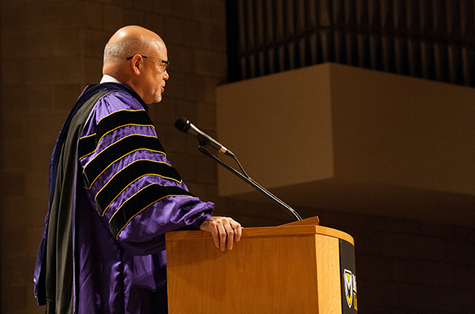 He thanked Jo Young Switzer and Bill Robinson, former Manchester presidents who returned Friday to the University to be honored for their years of service. 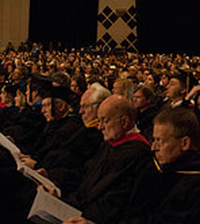 McFadden said we do well to “remember those who served Manchester well, who planted what we are reaping today.” This includes the nation’s first peace studies major and an environmental studies program “before either was cool.” He also cited the University’s vigorous study-abroad program and the student-initiated gender studies minor. “They put in place programs and ideas and world-changing graduates,” he said. He said that Manchester students get surprises when they travel abroad for the first time; when they become comfortable giving immunizations even though needles make them nervous; or when they become lifelong friends with a roommate they weren’t sure they could even live with at first. In his case, the big surprise came when he met the love of his life, Renee, during first-year orientation. Their two children are the fourth generation in their family to graduate from the University.